I tossed up the alternative title for this post as ‘why I will probably never eat commercial baked beans again’. 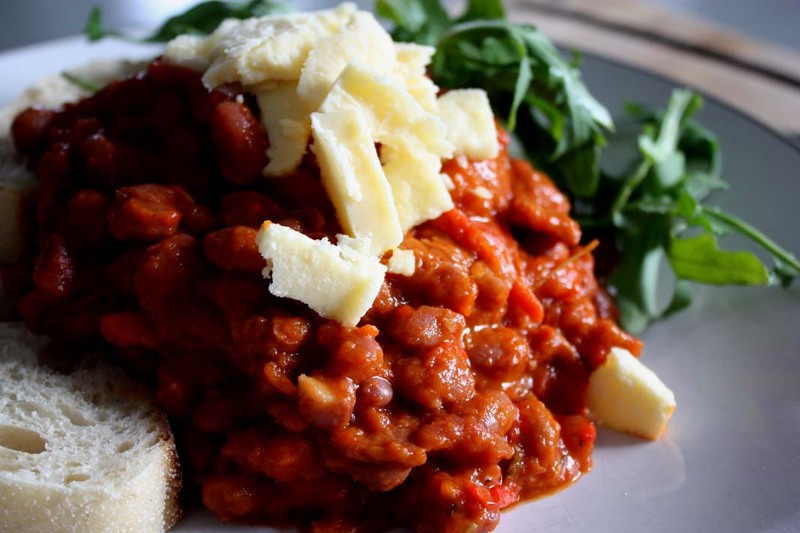 Seriously a little experiment has turned into a major revelation about the humble baked bean. I will start with declaring myself to be a fan. I grew up with them as a part of my childhood and I tend to think of them as a comfort food. I’ve always been totally okay with buying them in the supermarket pre-made, and maybe spoiling myself if I can find good organic ones around. I love them with a bit of melted cheese, on the inside of a jaffle, or as I recently discovered, baked with an egg poached in the middle. Finding myself time and time again declaring to be a massive advocate of making meals from real ingredients (an opinion that hasn’t changed by the way) and I can’t believe that I haven’t ever given these a go. Boy am I glad that I finally took the time. My recipe is inspired by Stephanie Alexander, from her classic Cook’s Companion. The ingredient list sounded super tasty and her declaration in the book, similar to mine above, had me intrigued. As always, I’ve added my own touch based on what was in the pantry and suited the vision in my head. These take time, but the beauty of them is that it’s the time that yields the best flavour as they slowly bake away in the cast iron pot whilst you potter around the house doing some of your favourite (or not so favourite) things. 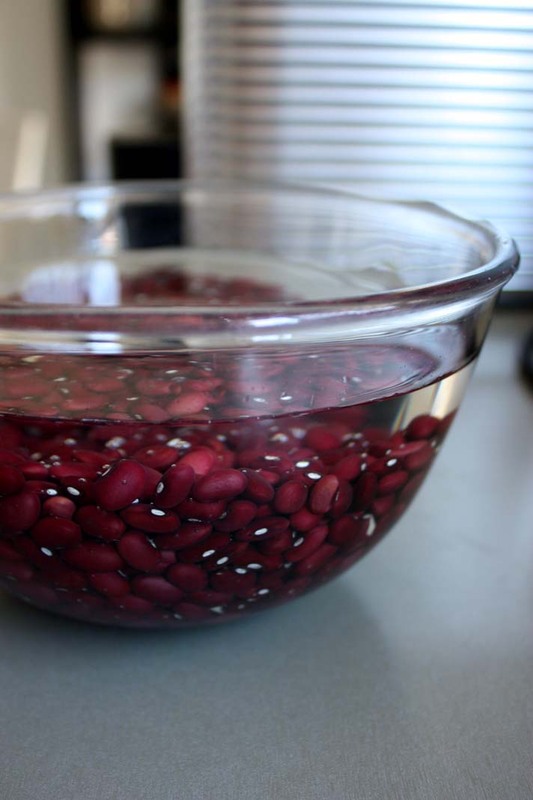 Pre-Soak your beans overnight in a large bowl, or at least for about 6-7 hours. they will about double in size so you’ll need a larger bowl than I went with and then had to upgrade. 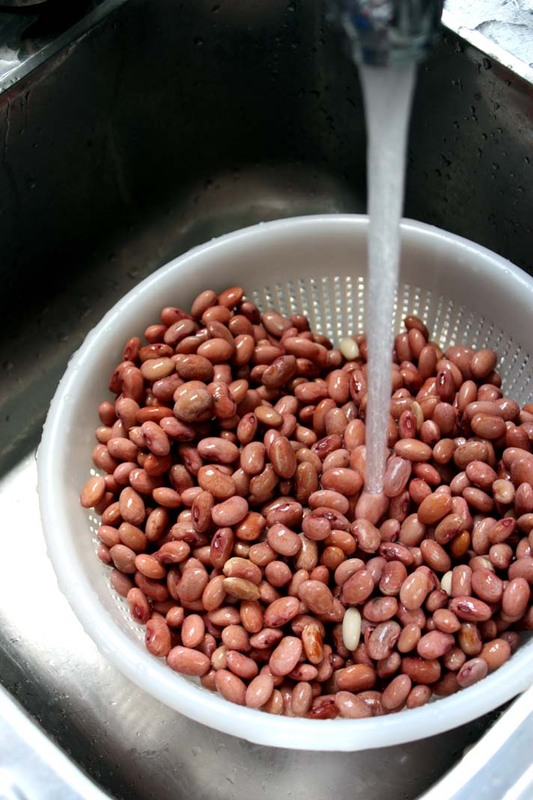 To prepare the beans, drain from the soaking liquid and wash under cold water. 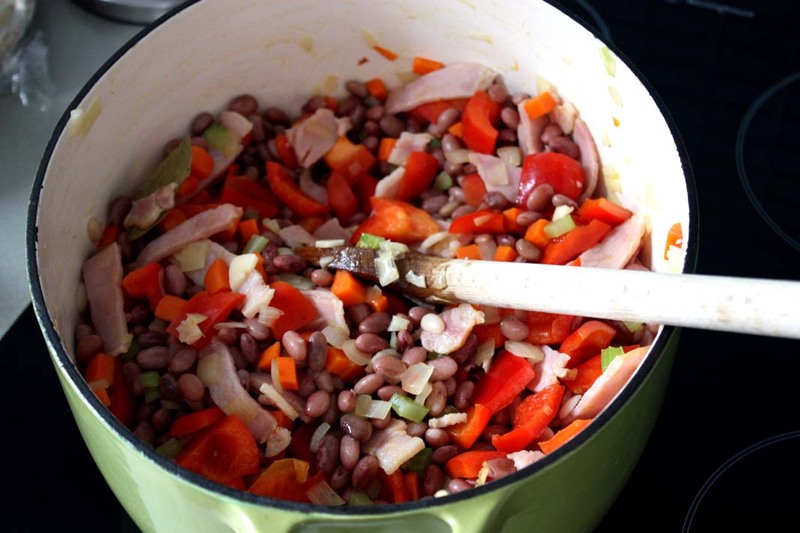 Add the beans to a pot of water and bring to the boil. Drain again and run under cool water to arrest the cooking process. 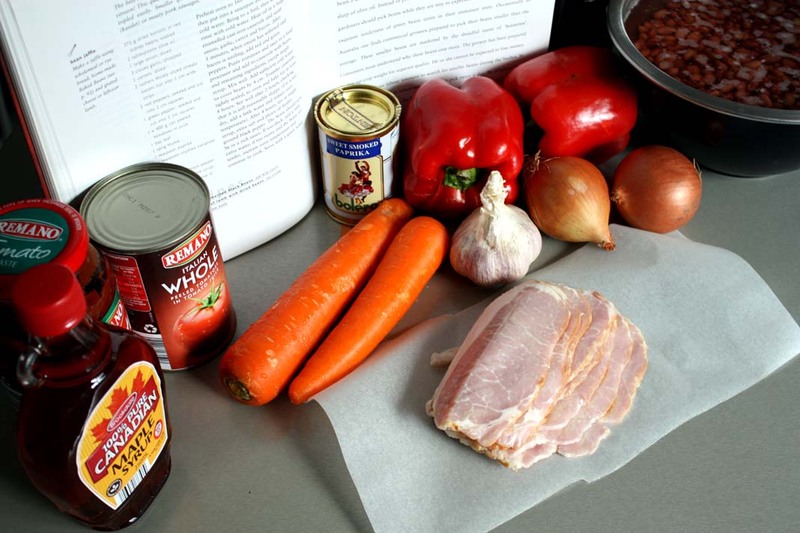 Prepare your vegetables & bacon before you begin the cooking process. 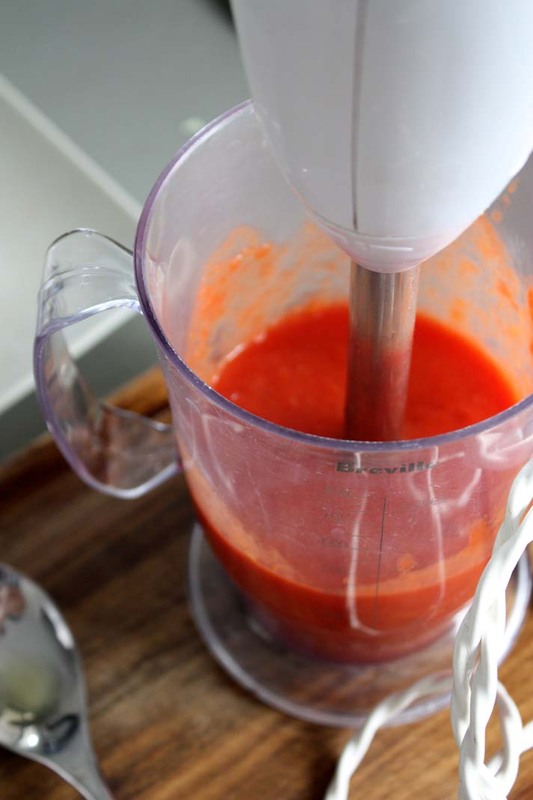 Puree the tinned tomatoes including the juice in a blender or with a stick mixer. Pre-heat your oven to 160c. Heat your cast iron pan on the stove top and add in the olive oil. 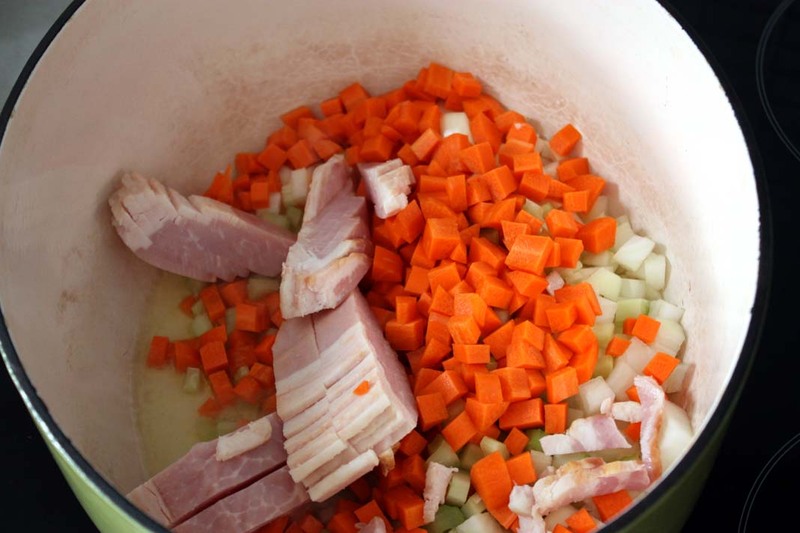 Cook off your bacon, carrot, celery, onion and garlic for about 5 minutes, or until the bacon is browning slightly and your onion has turned translucent. 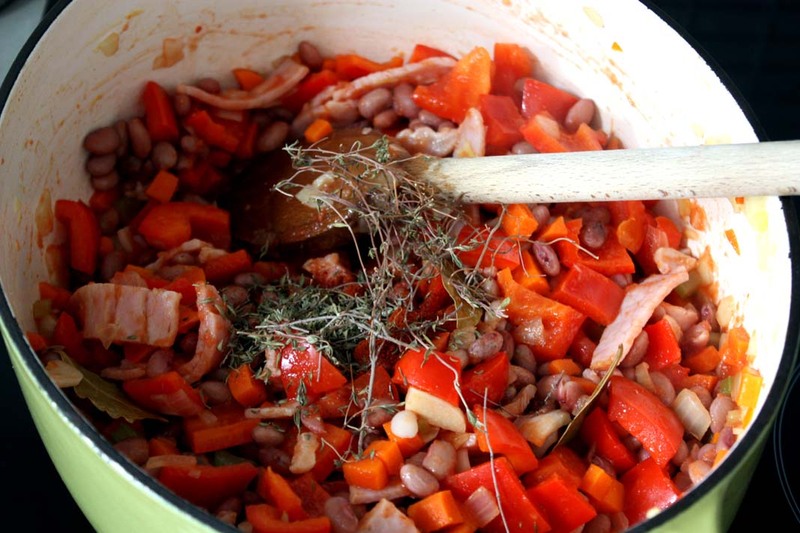 At this point add in your capsicum, beans, the herbs and tomato puree and combine well. Add enough water to cover the beans and have about 3cm over the top of the mixture. Cover the pot and put in the oven for approximately 4 hours, stirring at about the halfway mark. Once cooked you should have a nice thick sauce, but that still moves freely when you stir. 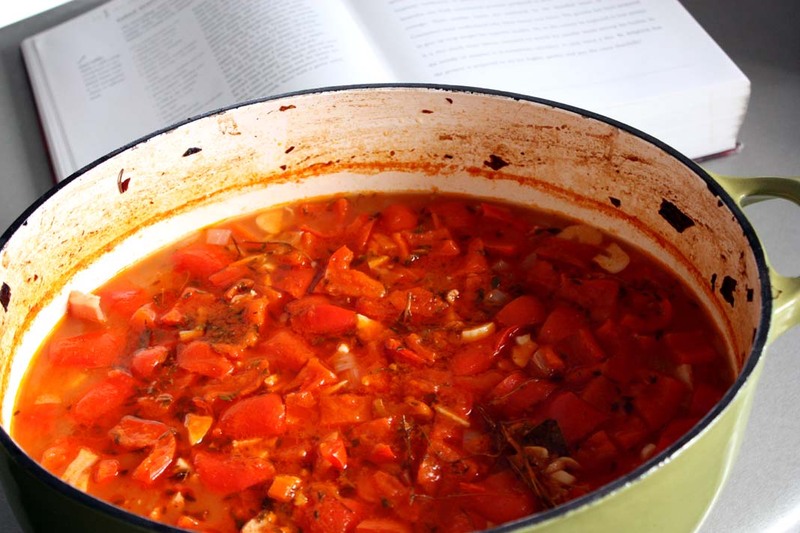 If it is still quite wet, cook for longer, if the mixture is too thick then add a small amount of water. When it is the consistency that you are happy with, season with freshly cracked black pepper and stir through the tomato paste and maple syrup. Salt if you think it needs it, although I found that between the bacon and the tomato paste it was seasoned enough. 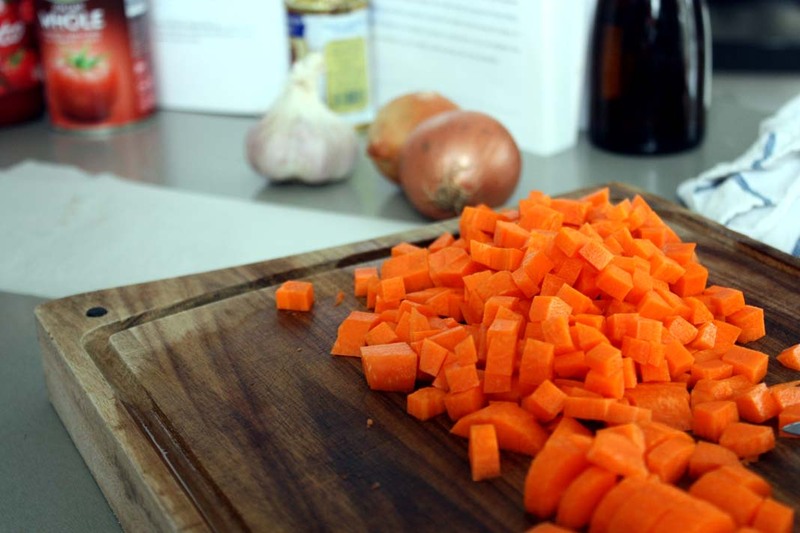 Serve hot with a poached egg, on its own or with a slow cooked piece of lamb. First up, I choose some sharp tasty cheese crumbled on top of my beans on toast with some rocket on the side. Delicious on its own for every meal of the day, or as a side dish to warm you in those winter months. Hey! First to like and comment! 🙂 This is an incredible recipe. I grew up on my mom’s baked beans and never 😦 got the recipe. I always buy canned baked beans too. 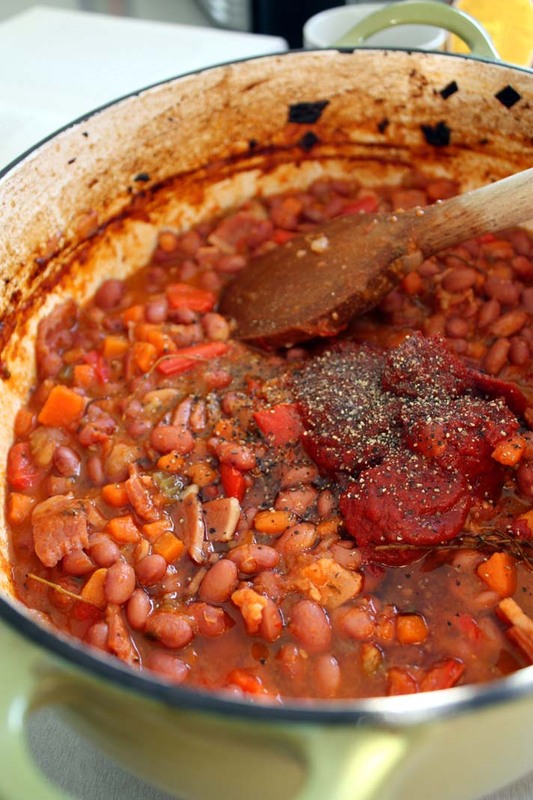 I love baked beans and I consider it true comfort food too. I’m excited to see your post. I think I can do this!